Almost a year ago I was intrigued to discover that Victoriana Nurseries in Kent offer plug plants of a perennial cauliflower that they call 'Cut and Come Again' and which are described as producing up to ten mini heads from each plant. I imagined that these would be tiny 'designer' heads of cauliflower when I planted the plugs 90cm apart in my walled fruit border. The reality was slightly different, but the journey to maturity was fascinating. It's a source of amusement to me that, rather as the fashion industry has to have 'this season's colour', now that veg growing is the trend du jour there are seasonal topics here also. Last year it was edible flowers, with some supermarkets offering tiny salad bags of flowers at exorbitant prices. This year's buzz seems to be perennial veg, as mentioned in numerous books and magazines. Shortly after I planted the cauli plugs, I was invited to a little soirée of gardeners and garden writers and managed to silence the room when I mentioned that I was growing perennial cauliflowers. Gracious, what a novelty! Perennial veg! So, yes, just once I have managed to be on the forefront of something trendy although, of course, perennial veg is not new at all. Martin Crawford, Director of the Agroforestry Research Trust in Devon and best known for creating his forest garden, has written a book on the subject which I'll review this week because it's worth knowing about. The only known variety is called Perennial Nine-Star Broccoli (due to the number of side shoots) which is the type supplied to me by Victoriana Nurseries. It's recommended to place the plants in a sheltered position although they proved to be extremely vigorous in the funnelling winds of the veg patch fruit borders. They needed staking as they grew to be over 4 ft tall and, if left to go over and flower at the end of the season, can reach over 5 feet and be an absolute bee magnet. Mine were well over 3 ft in width, which somewhat surprised me as the planting distance is advised to be 90cm. To get round this, I kept whipping the very large lower leaves off - they were drooping and providing shelter for wintering slugs and snails anyway. The plants will go on producing for five years so it makes sense in the fourth year to save the seed from one plant and then start at least one new plant each year for a continued supply. These plugs were incredibly easy to grow, one small hole dug, a bit of mulching and a bit of staking - obviously the hard work had been done for me by the suppliers! However, having spaced them according to the enclosed instructions, I realise now that those recommendations are fine for a field or allotment but not when the plants are sharing the space with fruit trees. It all started to get a bit overcrowded by April but that's okay as I'll try and move a couple of them now that they've been cut back, all bar one (keeping the bees happy). I was fascinated to see that the caulis all grew at different rates, planted north to south in the same soil. The most southerly plant (in a 7 metre row) grew fastest, largest and produced a head before the others. Some of the plants produced mostly florets, the largest produced just the one cauli head. I suspect the reason for this is the British weather - a warm winter followed by lots of sun, lots of rain... hardly the typical spring conditions needed by the plant. The heads and florets came thick and fast once the plant started cropping (as did the grey woolly aphids). I had plenty to offer friends and neighbours but would have preferred a longer cropping season because the secondary shoots were extremely delicious, whichever way they were cooked. Victoriana sell the plug plants in sets of 5 which would satisfy a family of 4 (or more) cauli lovers for at least a month - more if the weather permits. (I had nearly two months of pickings.) You do need to watch out for woolly aphids, be prepared to squirt them with an organic spray and give the florets a good wash in water with a splash of white vinegar added to dislodge any bugs. Strangely, the pigeons didn't seem to bother with the plants beyond the occasional peck at the leaves, perhaps because someone keeps chucking bread crusts for them. In another situation, I would net the plants for protection. What I have enjoyed most is the sight of veg growing in the middle of winter, the availability of freshly picked stems in early spring and the ability to harvest just one or two stems if I fancy a few steamed cauli florets for a snack lunch. If, like me, you're partial to a bit of cauliflower, this is the plant I'd recommend growing - plant it once and, with an annual mulching of the soil, you're set up for spring veg without further ado. If you're interested in growing perennial cauliflowers yourself, plugs can be bought from Victoriana Nurseries here. I planted mine at the end of July, probably a tad late, but still reaped the rewards in the following spring. The warm extended autumn last year no doubt contributed to the plants' excellent growth up to the cold snap in early 2012 and therefore a good subsequent harvest. I photographed the plant's development throughout the year - who could resist photographing a monstrously huge plant in December when all else is dying off? I've chosen 12 photos which chart the progress and have squeezed them into 4 rows. Apologies for the smallness of each frame but you'll get the general idea! Cauliflower plugs planted 22 July 2011. Photos from left: 8 inches high 6 weeks after planting; 15 inches high, 9 weeks after planting; right pic taken 2nd December, plant now about 2 ft tall. 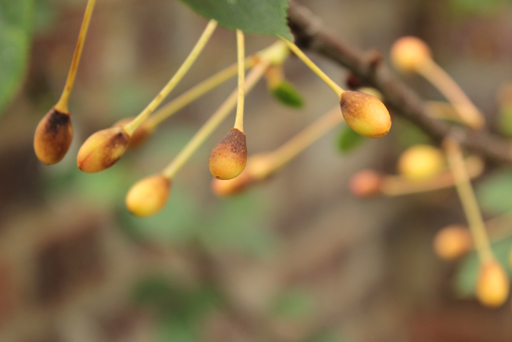 Frozen caulis in early Feb 2012; shoots forming in the leaf bracts mid-March; statuesque plant by early April. First 4" head beginning of April; sprouting shoots end of April; still edible but starting to 'go over' early May. Cloud of bolted florets by early June, which had turned to flowers by mid-June. 3 week old stump resprouting. So, here it is. The only poppy flower I'm likely to see in the veg patch this year. Extremely windy weather made conditions for taking photos quite tricky but, having spotted that this very last flower had opened, I knew I had to grab the opportunity to record it with a photo. You can see that the petals have already suffered by being battered around but I'm pleased to get this shot, regardless. It was taken in the early evening, the skies were gloomy and rain threatened so lighting conditions were pretty dire! I had to use a very fast shutter speed combined with flash to freeze the flower as it was whipped around in the wind, together with lots of patience and balancing steadily for this hand held shot! A macro of the centre would have been nice but impossible, given the conditions. I haven't been down to the garden yet today but I expect the flower is now just a stalk. This will have to do until next year. So much for keeping a daily eye on the progress of the coral poppy... I went away last weekend and returned to find that the plant had flowered and then dropped its petals in that time! Must have been quite a show; there were half a dozen of these fuzzy seed heads, leaving two buds still to flower. One had opened this evening - I found it being wobbled around by high winds. I wonder if that will still be there to photograph tomorrow morning? With one left after this, and a busy Saturday planned, I feel the window of opportunity is closing rapidly! Do they flower twice in a year? I hope so! I'll leave the seed heads but I bet they'd look lovely tucked into a vase of flowers! I know nothing about growing fruit, even so I was horrified to see that the little fruit on one of the Morello cherry trees is in an advanced state of brown-ness. This is a stark contrast to last year when I was able to snap ripening red fruit for the blog. I have no idea what might be the cause of this, so if anyone has any suggestions, they would be much appreciated. 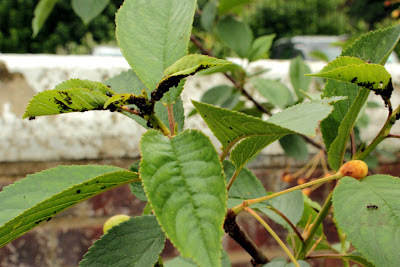 The tree has also, rather suddenly, become infested with blackfly. The apple trees were similarly infested a week or two ago and, on the advice of an organic gardener at Camley Street Nature Park (where they grow apple trees on a moored barge, how exotic! ), I mixed Ecover* washing up liquid in a ratio of one part soap to 10 parts water, poured into a spray bottle and squirted liberally over the bugs on the tree. This appears to have worked, to a larger degree. I was told that Ecover works more efficiently than other washing up liquids as it contains a plant based ingredient which covers the insect with a waxy coating, depriving it of air and, thus, life. Whether it's the blackfly that have caused the disastrous demise of the cherries or an excess of British weather (more likely), Operation Squirt will be top of the agenda on Sunday when I return from a visit to family on the coast. I should also add that I'm not averse to a bit of manual squishing (preferably with gloves), in accordance with the advice given by Monty Don. * Ecover is a brand of environmentally friendly cleaning products, widely available in the UK. The washing up liquid uses plant-based ingredients rather than petrochemicals which is why it's believed to work better than other liquids as an organic pest control. Twenty four hours of rain has been great for the veg; I wish I'd put out some tubs to catch some of it. I popped out earlier in the rain to sow another patch of parsley and noticed that one poppy bud had started to split open. Time for a photo! I love the way the raindrops are just caught on the hairs and the petals are pushing out of the bud. Looks like it will be a beautiful colour too. I'm hugely relieved to have an extra day off work this weekend. Dare I say that I won't be celebrating? Much as I think Her Maj is a wonderful, decent, long-suffering and hard-working woman, I have too much to do to make time for jollifications and revelry (never mind the ensuing hangover!). My feet seem to have hardly hit the ground in May; between work and garden, my cup has indeed runneth well over (leading to many post-midnight bedtimes, so exhausting...). I've been potting on seedlings in the mini-greenhouse or starting them off, weeding in the veg garden and harvesting cauliflower sprouts, kale, cabbage, herbs; transplanting raspberry runners, moving strawberry plants, topping up raised beds (and potatoes in sacks) and filling large pots for overflow veg, squishing or squirting blackfly on the broad beans and fruit trees, and, finally, sowing flower and radish seeds outside - and, of course, watering, watering, watering. More or less the same as every other gardener, I imagine! Chillies, capsicum and bell pepper seeds sown into modules at the beginning of April, two to a module, all germinated successfully and (because I hate to waste a perfectly good plant) all potted on successfully in mid-May into J. Arthur Bower's seed and potting compost (recommended by Which? garden as the top compost in their trials last year). Total: 3 Purple Beauty bell peppers, 3 Orange bell peppers, 4 Chilli Corno di Torro Rosso, 1 Hot Banana chilli, 2 Chilli Guindilla Roja and 3 Hamik capsicum. One way or another, it will be a hot summer! Purple podded peas have gone out a few days ago; courgettes, sweetcorn, popcorn, mangetout, kidney beans and dwarf french beans to follow before the weekend is out. The Lazy Housewife bean (growing in the safety of my balcony at the moment) is about 3 feet tall, much to my relief. Borage seedlings have been planted out under the fruit trees, several Violet de Provence artichokes have gone in at the back of the walled border (yum, looking forward to eating those!) and radish seedlings have appeared amongst the broad beans only days after the seeds were sown. Nasturtiums (3 varieties) are growing well, californian poppy seedlings have been set amongst the herbs, orach, calendula and geums are adding a pop of colour to the sea of green veg, and a Coral poppy bought last year is now looking very gorgeous - can't wait until the flowers unfurl as this will be the first year of flowering! My efforts of last year are still rewarding me: Hearted cabbage is still waiting to be eaten and I'm picking tender kale leaves for lunch and for the freezer as those plants look as though they'll flower soon. I've discovered a fabulous River Cottage recipe for kale: simmer the leaves with finely chopped garlic until soft, drain and chop finely, pile onto toast and adorn with shavings of parmesan. Quick and delicious! One word of caution though - caterpillars! I carefully picked over the leaves, then left them in a sinkful of water. After about 10 minutes I found 8 tiny caterpillars at the bottom of the sink. A further soak in a water/cupful of vinegar mix netted another 4 caterpillar babies. And I thought I had good eyesight! The perennial cauliflowers are a story in themselves and I'll post about them this week. They've now spectacularly sprouted, some have flowered and look beautiful, others were covered in grey aphids so have been chopped back to the ground - and are beginning to resprout! My teenager just asked if he could help me in the garden (think Bob a Job week, accelerated to millenium rates of pay). After a quick think about what still needs to be done, I've said yes; despite what felt at times like re-enacting the Labours of Hercules in May, there's still a border to clear, 2 walled beds to dig over, strawberries to move, seedlings to be planted, bean towers to be built and 2 raised beds to be constructed and filled. Yes, I will be more than happy to have his help ... I might yet stand a chance of enjoying a chilled glass of wine while standing back to watch the veg grow on a warm summer evening! Enjoy the Jubilee folks - I'm off to celebrate being in the garden! I love the colours of the kale and red orach next to each other!